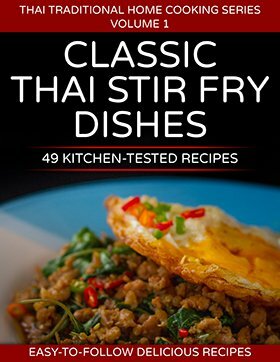 The names of Thai dishes usually communicate their main ingredient, their cooking technique or, at times, their origin. 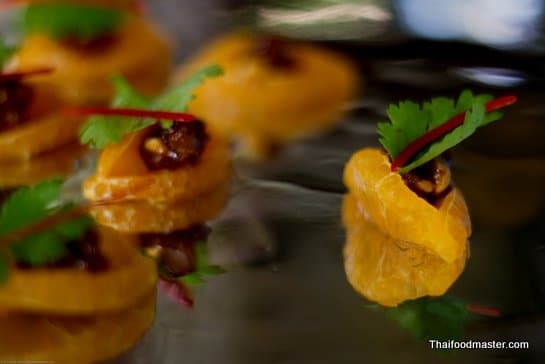 Yet, a large element in the charm of Thai cuisine are dishes bestowed with unusual – sometimes downright poetic names – such as “crystal dragon” (mang gaawn khaap gaaeo, มังกรคาบแก้ว), “galloping horse” (maa haaw, ม้าฮ่อ) and “fat horse” (maa uaan, ม้าอ้วน). Early Siamese literature was produced, patronized and supported, as well as controlled and consumed, by the aristocracy; it reflected the life of the court elites. 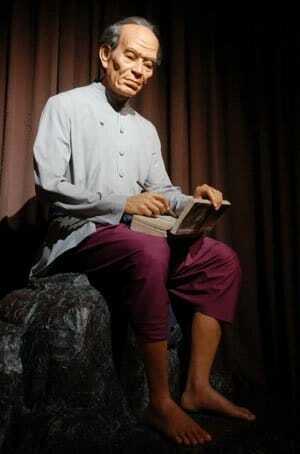 In contrast, Sunthorn Phu, the “poet of the people”, was the first classical Thai author who was not a member of the nobility. His humble origins and his use of popular language and simple forms of verse appealed to a wider audience. Sunthorn Phu was born in 1786, in the days of the early Rattanakosin era, and 19 years after the destruction of the capital Ayutthaya by the Burmese army in 1767. It was also a mere four years after King Phra Phutthayotfa Chulalok (Rama I) of Chakri Dynasty came to power in 1782, bringing to an end a chaotic period of power struggles and revolutions in which Siamese, Burmese, provincial warlords and Chinese merchants, along with missionaries and soldiers, were fighting for dominance. As child from a broken family, Sunthorn was famous for his unstable temperament; some said he was a drunk, a vagrant, and a womanizer who spent quite a lot of time behind bars. And, indeed, it was in jail that he began to write his epic work, Phra Abhai Mani – a colossus that spans across 94 books, totaling about 30,000 lines of verse. As a poet, Sunthorn spent much of his life under royal patronage, living to witness the reigns of four Kings. Respected by King Rama II, who commissioned literature, Sunthorn was disliked by Rama III; the resentment was generated by Sunthorn’s criticism of Rama III’s early poetry while the King was still a prince. Meanwhile, Rama IV appointed Sunthorn as a Poet Laureate, a position maintained until Sunthorn’s death in 1855. 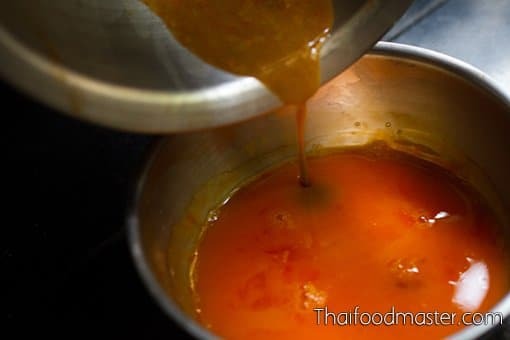 Maa uaan is first mentioned in Sunthorn Phu’s “Phra Abhai Mani”, which suggests that the dish enjoyed a certain amount of renown before emerging in print. Due to the popular “market-like” nature of Sunthorn’s writing, we can safely assume that maa uaan was a dish consumed by commoners. 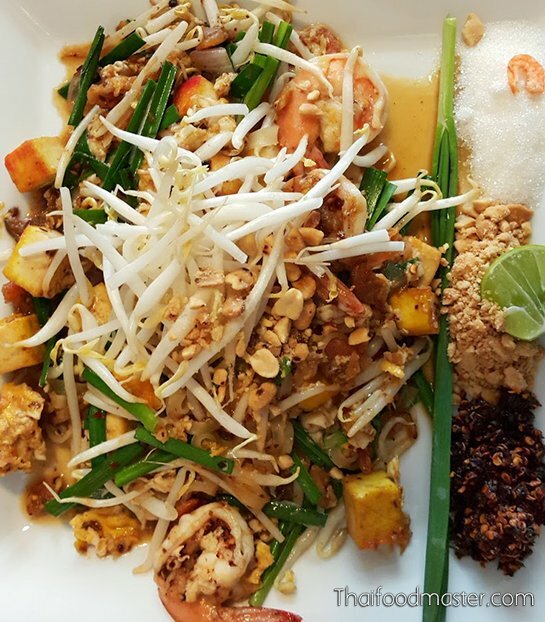 But, since the dish is not typically Thai, it could also be that it was served in only during special occasions or ceremonies. 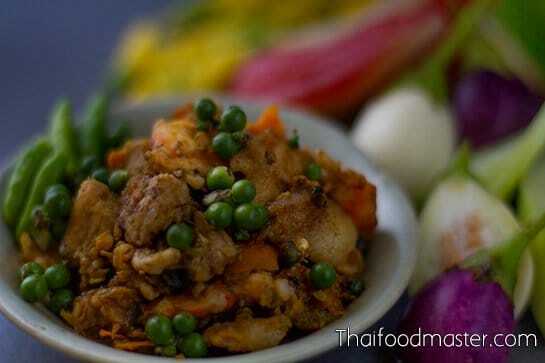 Maa ouan is a dish with clear Chinese characteristics. 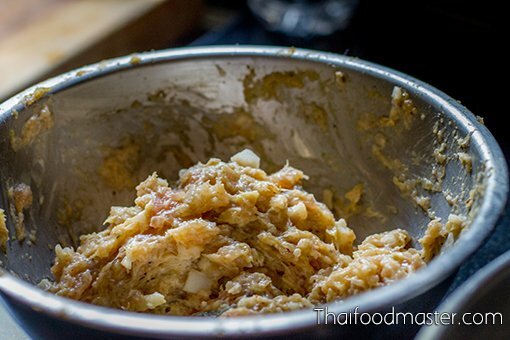 It resembles the filling of khanohm jeep dumplings (ขนมจีบ), the crab and pork meat fillings of haawy jaaw (ฮ่อยจ๊อ), or the shrimp and pork meat mix of haae geun (แฮ่กึน). Sunthorn Phu also takes the time to note other dishes that are clearly of Chinese origin, such as steamed duck (bpet neung, เป็ดนึ่ง) and barbecued suckling pig (สุกรหัน). 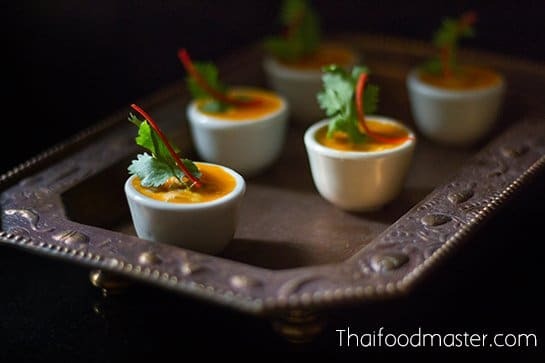 King Rama II, who respected Sunthorn Phu’s work, also refers to some favorite royal dishes of clear Chinese origin in his culinary poetry Gaap Heh Chohm Khreuuang Khaao Waan (กาพย์เห่ชมเครื่องคาว – หวาน), recited or sung during the procession of the royal barge. Those dishes included sohm choon, a lychee dish, as well as boiled pork spleen (dtohm dtap lek, ต้มตับเหล็ก), steamed bird’s nests (rang nohk neung, รังนกนึ่ง), and persimmons (luuk phlap, ลูกพลับ). We will demonstrate today’s maa uaan recipe as recorded in Lady Plean Passakornrawong’s 1908 book, “Maae Khruaa Huaa Bpaa” (แม่ครัวหัวป่าก์). Minced pork and shrimp meat are seasoned with garlic, coriander roots, white peppercorns and salt, then mixed with duck egg and a bit of coconut cream, placed in small ceramic cups (thuay dta lai, ถ้วยตะไล), and steamed. 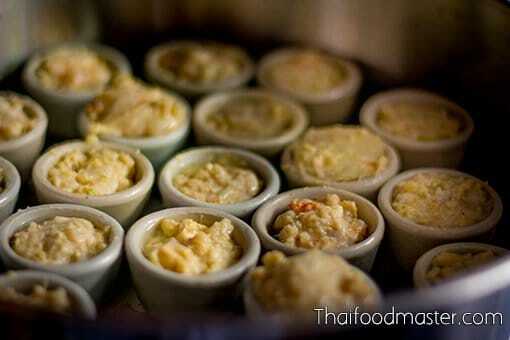 It can be served either as a starter, an hors d’oeuvres, or even as a side dish to curries. A slightly different version appears in Lady Gleep Mahithaawn’s book, “Recipes for Teaching Children and Grandchildren” (หนังสือกับข้าวสอนลูกหลาน), printed for her 72nd birthday celebration on January 7, 1949. Lady Gleep Mahithaawn writes that minced chicken meat can be used; she also adds crushed roasted peanuts, and lengthwise-sliced pickled garlic. 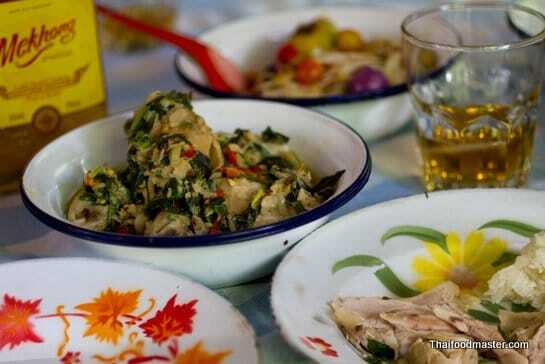 Maa ouan is an appetizer with clear Chinese characteristics. 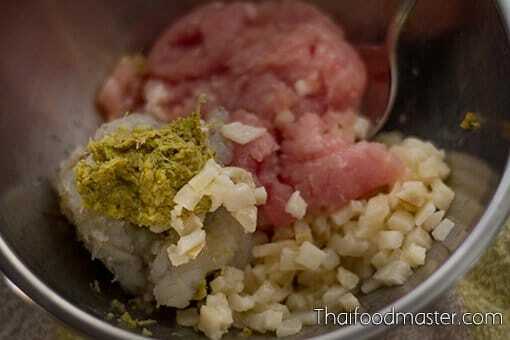 It resembles the filling of khanohm jeep dumplings (ขนมจีบ), the crab and pork meat fillings of haawy jaaw (ฮ่อยจ๊อ), or the shrimp and pork meat mix of haae geun (แฮ่กึน). 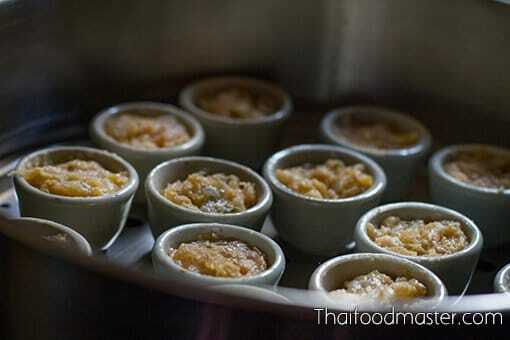 Minced pork and shrimp meat are seasoned with garlic, coriander roots, white peppercorns and salt, then mixed with duck egg and a bit of coconut cream, placed in small ceramic cups (thuay dta lai, ถ้วยตะไล), and steamed. 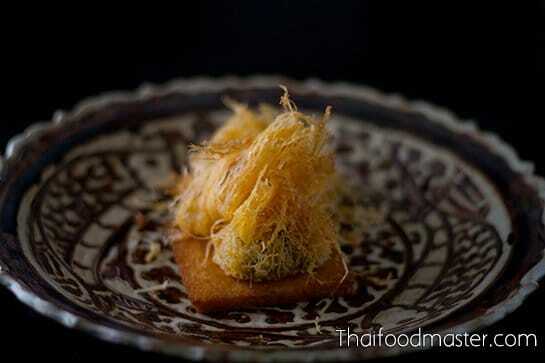 It can be served either as a starter, an hors d'oeuvres, or even as a side dish to curries. 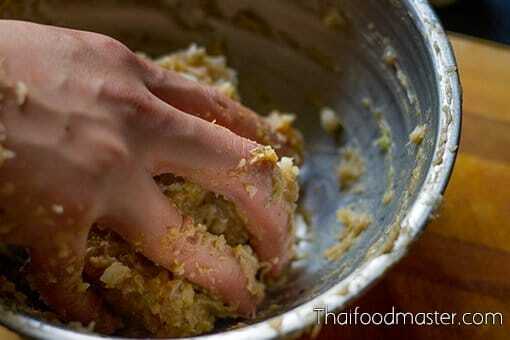 In a pestle and mortar, pound together coriander roots, garlic, white peppercorns and salt. Set aside. 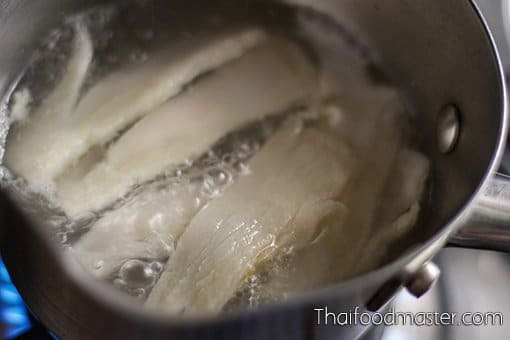 Boil thin slices of pork fat until cooked. Strain, and cool to room temperature. Slice the pork fat into small cubes. Set aside. Place in a mixing bowl the minced shrimp meat, minced pork meat, the pork fat cubes, duck eggs and the garlic-coriander-white pepper paste. 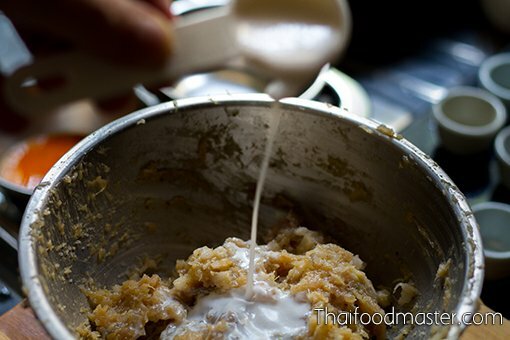 Knead the mixture thoroughly, throwing the mixture into the bowl a few times to help condense the texture of the meats. 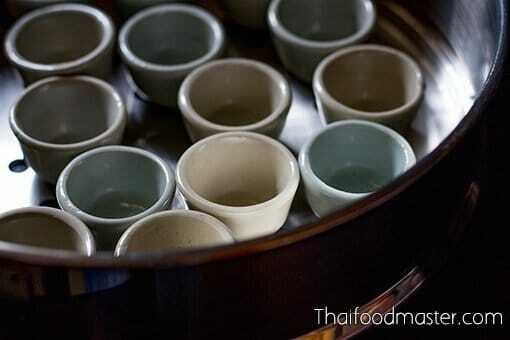 Place small ceramic cups (thuay dta lai, ถ้วยตะไล) on a steaming tray. Spoon the meat filling into each cup, leaving a 0.5 cm gap from the rim. Steam the cups for about 5 minutes. Mix the shrimp tomalley with the duck egg yolks. 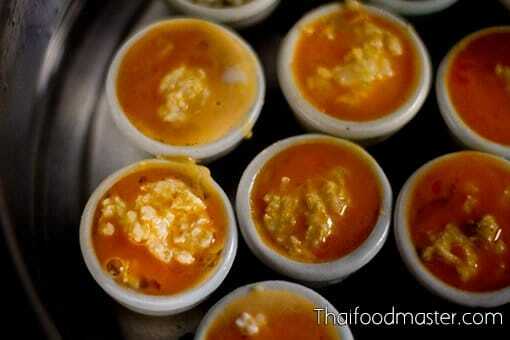 Drizzle the yolks, filling each cup completely. Steam for additional 2 minutes. Decorate with coriander leaves and julienned fresh red chili pepper. Serve.